Does your neighborhood have a lot of trees? Trees cover our part of town. Tall ones, short ones, and in between. I love it. From where I write green fills my view of our backyard. Birds chatter and chirp. When there’s a breeze, they sing while grasping the swaying limbs where they perch. It’s those breezes that capture my gaze today. Well, not the wind itself. Can’t see that, of course. It’s the leaves. 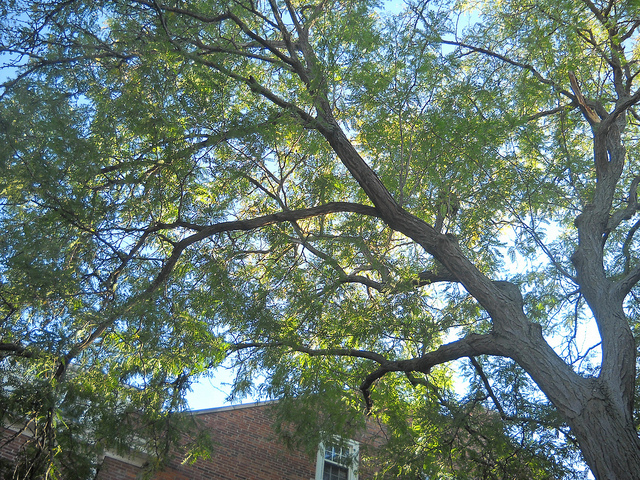 And those branches that wave to each other with grace, like neighbors calling to neighbors over the backyard fence. My imagination takes over, and I’m almost convinced that the leaves and branches move themselves. But my common sense knows better. …And I’m back to the breeze. Without that, the trees have no movement. No dance. It’s what brings them to life and makes them graceful. The dancing trees give visual testimony to the invisible wind. So it is with our God. Without Him, we stand solitary and motionless. We exist, but there’s no dance. Yet when we give Him our life, He breathes His Holy Spirit over us and into us. We move. We sway. We reach out to others who’ve joined the dance. We’re full of grace, and the world sees the evidence of the invisible God.